St. Johns County Ocean Pier is across the Bridge of Lions on Anastasia Island in the city of St. Augustine Beach. It is located on one of Florida's most historic coasts. 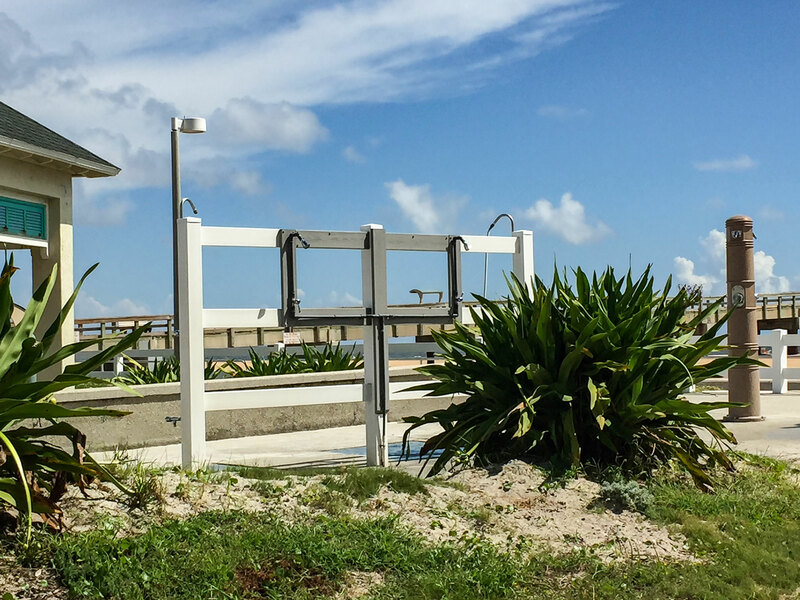 The pier has many free amenities like pedestrian ramps, beach access, a splash park, a covered pavilion, showers, bathroom, and parking for both regular vehicles and handicapped parking. The pier also has beach volleyball courts and bocce courts, and is walking distance from other beach and swim apparel shops, seaside restaurants, and coastal hotels. Please Note: Swimming and surfing are not permitted within 400 feet of the pier. The pier offers fishing and sightseeing for visitors. It's a nice place to relax and daily tickets are only $1. Fishing passes for residents and non-residents are also available. A daily pass for visitors to fish is $3 per person, and $2 for St. Johns County Residents. Get a yearly pass for just $20 or $30. 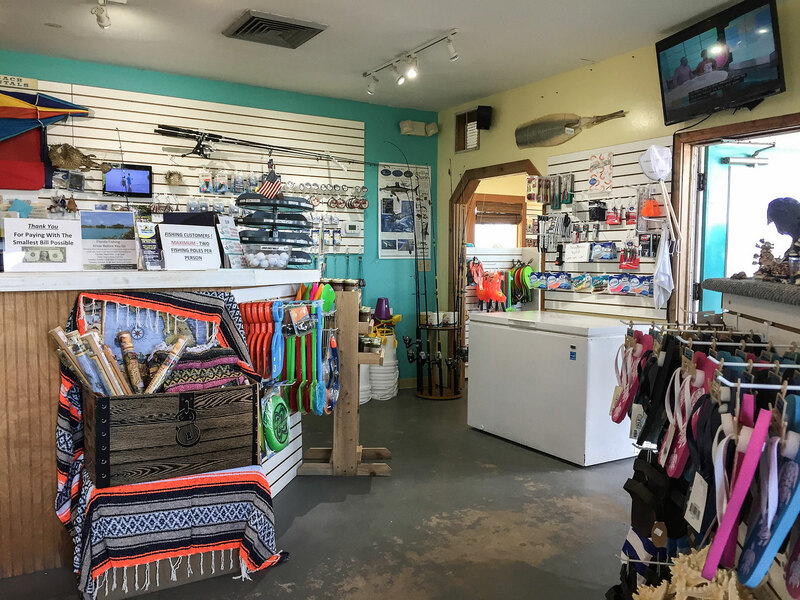 The pier also has tide charts and a bait and tackle shop, where visitors will find fishing necessities, including ice and refreshments to snack on during the day. The visitor center has a shop with shirts, sunglasses, and snacks. Forgotten necessities like sunscreen and fishing supplies are available to purchase. There is also an inside snack stand with pretzels, hot dogs, and a other convenience meals. At a desk counter in a single room, a member of St. Johns County waits to offers answers for visitors with questions about the area. The walls are lined with brochures, maps, and pamphlets for different attractions in the area. You can find out about local events, pick up a St. Johns County publication, or utilize coupon booklets in order to save money. The St. Johns County Ocean Pier is home to a variety of annual events, including the Music By the Sea series during the summer months, and the Beach Blast Off on New Years Eve. A splash park is located between the pier building and the beach. A ramp leads up to the splash area where there are covered tables and outdoor showers nearby. There is also a covered playground with things to climb on and a slide. 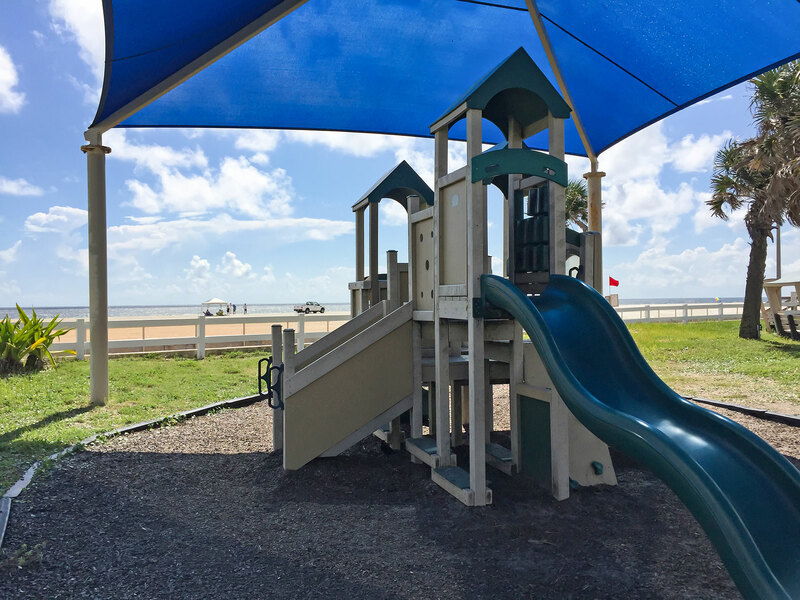 The playground is close to the splash park and offers a nice view of the ocean. Restrooms are located across the way from the south covered entrance to the Pier shop. There are also restrooms located on the building side facing the splash park. A shower is available on the side of the building for rinsing off sand from the beach, plus there is a line of outdoor showers between the splash park and the dance studio. There are 6 beach volleyball courts located in the area near the pier. The courts have been utilized for tournaments and are available to use if free or available to rent for a fee. The cost is $15.00 (plus tax) for St. Johns County Residents, and $25.00 (plus tax) for Non-Residents. Courts are reserved in pairs per hour. Up to four courts available. The courts are lighted for evening games. 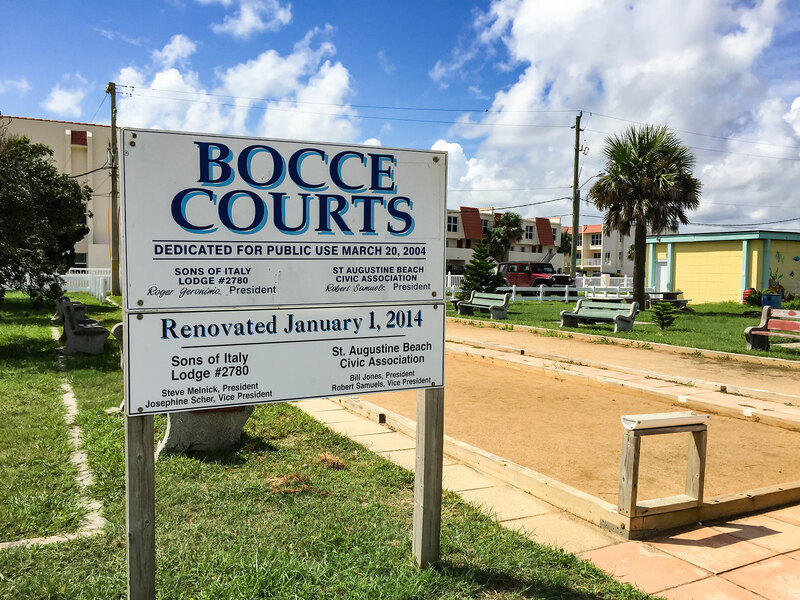 There are also two Bocce Courts for public located on the side of the pier property opposite of the volleyball courts. Bocce is a boules sport similar to petanque. The court is provided by the Sons of Italy Lodge #2780 and the St. Augustine Beach Civic Association. It was dedicated in 2004 and renovated in 2014. A covered pavilion is located near the handicap parking on the north side of the pier parking lot. The pavilion can be reserved for events by contacting Sydney Lindblad at (904) 209-0344 or slindblad@sjcfl.us. The pavilion holds up to 200 people and measures 84' x 84' (4,200 square feet). Although no tables or chairs are provided, rentals may be brought in to fill the space. An accessible ramp leads up into the pavilion and rentals are available for the entire day. The cost for St. Johns County Residents is $150.00 plus $9.45 tax for the day, and for non-residents it is $200.00 plus $12.60 tax for the day. Be the first to Review St. Johns County Ocean Pier!